Hello and welcome to my site. 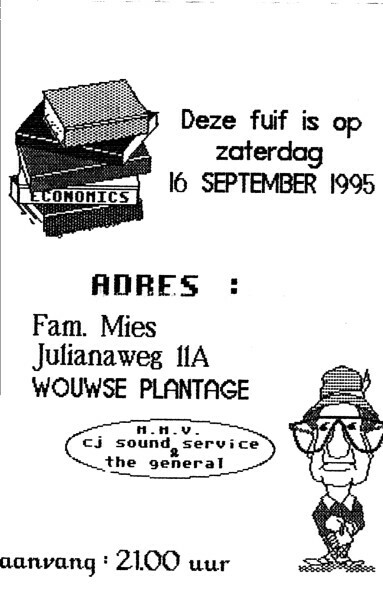 I started DJ'ing in 1994 in my hometown in Ossendrecht. I had to play on parties which were held once in a month. My DJ name was at that moment The General. These were a success in Ossendrecht, and also for myself, so I had a chance to play at a club in Bergen op Zoom. At that time I had also made contact with some Drive in Shows like Skylight and C.J. Sound Service. When they had a Disco / Dance party they asked me to play for them. In that period (1997 -1998) I made also mixes for a local radio station Z FM broadcasting in Zundert. After 4-5 years I stopped with the club in Bergen op Zoom, because I had several parties a weekend, and a girlfriend, also I felt I had to change to something different. Now there was more space for different party's, also disco party's with music from the 70ies, 80ies and 90ies. Then the Lazer Hot Hits website started in 2001, and I was one of the first DJ's which played mixes on that Internet radio station. I was always a big fan of that radio station in the early 90ies, (you can read some info about Lazer here.) and now I had the chance to play on that radio station. Now you can see me at several location, for example:: Rainbow Hoogerheide, Teerkamer bergen op Zoom, Lachende Vos Bergen op Zoom, D-Fusion Parties @ Bergen op Zoom and more... Also on the radio, read below for more information !!! Contact Info / bookings /etc : Just Mail me for details !! !